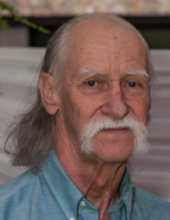 Orville Maxwell Calkins, a native and resident of Chickasaw, passed away April 9, 2019 at the age of 66 at his home. He is survived by his siblings, Ruth Lunsford (Ray), Dottie Watson, Erma Tullos, Lynda Salisbury, Wanda Wilder, Betty Hunter, Harold Calkins; nieces; nephews; great nieces; great nephews; and many more family and friends. He is preceded in death by his mother, Thelma Rivers Calkins; father, Arthur Calkins; brother, Burt Calkins; sister, Barbara Hambrick; brother, James Calkins. He was a founding member of Mercy Ministries. Orville was an avid Alabama Football, Nascar, and other sports fan. He volunteered with 12 Baskets and More Food Ministries associated with the Whistler United Methodist Church. He helped in the raising of many children who loved him tremendously. Orville worked as a carpenter and as an a.c. technician. Visitation will be held Monday, April 15, 2019 at 12 PM at Forest Lawn Funeral Home 9700 Celeste Rd. Saraland, AL 36571 followed by Funeral Service at 1 PM. Interment will be immediately to follow at Forest Lawn Memorial Gardens. To plant a tree in memory of Orville Maxwell Calkins, please visit our Tribute Store. "Email Address" would like to share the life celebration of Orville Maxwell Calkins. Click on the "link" to go to share a favorite memory or leave a condolence message for the family.